Coxreels features a complete line of Diesel Exhaust Fluid (DEF) hose reels built on the industry proven, all-steel construction SH and T Series of reels. These reels are equipped with a stainless steel external full-flow swivel and chemical resistant Viton seals to provide a safe, reliable DEF dispensing solution available with a factory installed, high-quality Goodyear DEF hose. The swivel is easy to access for simple seal maintenance and fast DEF dispenser hose installation. 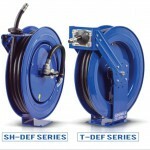 Coxreels provides professional reeling systems in heavy-duty single pedestal (SH Series) or supreme-duty dual pedestal (T Series) configurations that handle DEF hoses up to 75 feet of ¾ inch hose I.D. Both versatile designs are outfitted with Super Hub dual axle support systems to increase stability and reduce vibration during operation, making these reels the perfect DEF handling solutions for either stationary or rugged mobile applications. The DEF models are available in standard spring retraction and EZ-Coil controlled retraction systems that promote greater operator and workplace safety by retracting up to 80-percent slower than conventional reels. This DEF reel line has all the durable high quality components and superior finishes found in every Coxreels product. For further information on Coxreels® SLPL spring-driven models, contact Customer Service at (800) 269-7335 or visit www.coxreels.com.